Hello. My name is Sergey Chernoboev, I am Indy developer of computer games. Recently, I've received a letter from Falcoware company, which came to my e-mail. There is an offer to develop a computer game in a letter - a small shooter. I thought "Money will not be superfluous for me" and agreed. My chief gave me 2.5 months for the development. I should create all program part during this time, a plenty graphics and game design. It was decided to take free license soundtrack, where was required to specify only the name of the artist. First of all we should decide what will this game be. Having estimated timing and strength, I decided to do a little TDS � Top Down Shooter in Crimsoland style. The shooting will take place in small enclosed locations, a lot of nasty monsters and other entities will attack the player. To make combats more dynamic, we shall add rapidly changing weapons, which gives to players as a bonus. Also, I decided to add feature, which I didn't see in any TDS � an opportunity to make a powerful super attack, which will kill all the enemies in a few seconds. And of course we shall add an opportunity to upgrade your hero during the game. Sincerely I don't like different upgrades in such games. To my mind upgrade is relative to RPG. Especially I don't like when some developers create a hero weak, slow, so you can't play. Of course, they expect that after 10-20 minutes the player pick up money (experience) and make his hero upgraded, making a killing machine. But we should hope that hero will not stop to play game up to this point. That's why my upgrade will be easy and relaxed, the gun power will be upgraded, hero's speed, armor and a separate scale - upgrade game moments such as bonus approximation or increasing money for the passed tour. 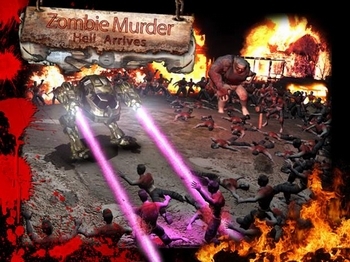 Simple zombie � it the main enemy unit, it will emphasize in all levels. Chainsaw zombie � sure should be fun. Acid spitting zombie � hm, it seems like it used somewhere, but it's ok, it goes anything. Giant zombie � ���������� �����, �� ��� ��������. ��� ����������� ����� �������� ������, ����� �� ����� ��������. It is enough for first location. Let's think about bosses. I remembering the game �Sonic the Hedgehog�, it was the same boss at the end of each location � either weasel or a beaver - I don't remember exactly. So, this boss in fact was the same person, but in different location he had different killing machine, in which he sat. It's a good idea, let's borrow it. The boss will be look like a big skull, in each location it will look different way and will have different attacks and behavior. It should be fun. Well, now comes the hard work of creating graphics. We are modeling zombies. Such a handsome. It's a pity that we have only top view, we will not be able to see them in the game completely. And only after several days I knew that withered zombie's hand was invented in a game "Left For Dead". Well, do not alter the same, so much work done. Okay ... let's hope that nobody notices. Choosing MH (main hero). Actually, MH was obvious for me. I have long wanted to make a game with a big robot with two guns on each side. At one time I was extremely impressed by the robot ED-209 from the film "Robocop". Simulate something similar in design. Yeah, It should be funny. Zombies were made, but let's create weapon before adding zombies to the code. Machine gun � unlimited default weapon, shoots when no other weapon. Rockets � the classic, what can I say. Flamethrower � not less than the classic arms, although less common. 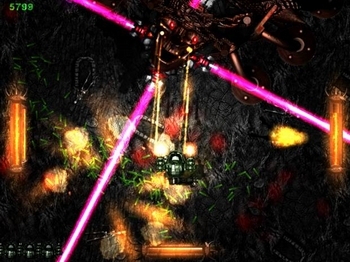 Laser � let's make a long purple ray, piercing through the enemies. Well, it will be enough for beginning. So, weapon is created and added with special effects. It's time shoot someone using this weapon. Including zombies to the engine and writing artificial intelligence (AI). 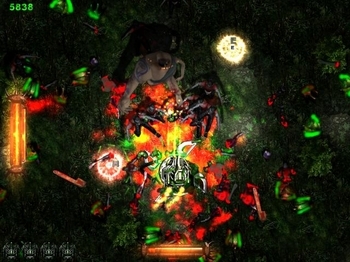 The enemies are attacking MH, avoiding each other and when approaching attacking. Chainsaw zombies run first. And when they are able to approach the MH, they starting the chainsaw and raise it in front of themselves. Let's add an opportunity to chainsaw zombies to cut usual zombies, I think it will be funny. Giant zombie initially slow, but when you shoot him, he change his rate and rapidly approaching to MH, but he slows down again, when you stop shooting him. It's time for super attack. At the very beginning of development there was an idea to make such a super attack � 4 giant blades are getting off the monster's body, they rotate and chop zombies. But this super attack is not compatible with my MH � blades have nowhere to come out. Ok, I'll save this attack for the second MH if I'll have time. And while the attack of my MH will be look like this: several fireballs flies and rotating around the character and setting fire to enemies. Super attack will be able to apply in the case if zombies surrounded your hero and there is no way to go. The scale of the super attack will be filled as enemies will be killed. That's right. MH shoots, enemies die. It is time to do upgrade! There's nothing particularly to talk about, it's pretty corny � when pressing SHIFT button the game will be paused and a panel with 4 parameters will appear at the screen, these parameters will be upgrade, when the hero will press the plus bitton at the appropriate scale. Upgrade will be done for money. The money will be given at the end of the level for shooting accuracy, for saved lives and for the rapid level passage. The whole week was spent to create the upgrade system! We should hurry, a month remained to take the game, but I still didn't do nothing! Now it's time to create bosses. As I planned bosses is the same skull, presented in different forms with different attack styles and behaviors. And why not put the boss right in the very beginning of the game - the player started the game and boss attacked him immediately. Let's do that. The first boss will be weak of course, even my 5-years old nephew will easily win him. 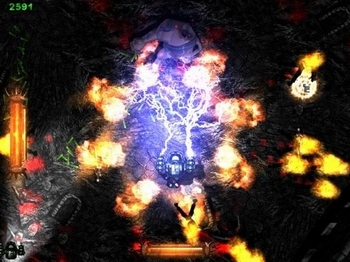 Further bosses will already be a serious danger and complexity should be such that they were killed in 2-3 attempts. So, the bosses are completed and I have a week and a half. Let us not lose this time, let's embed the second MH. 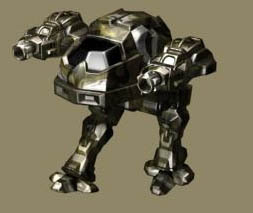 The second MH is a flying robot with one cannon, but he will have a much greater rate of fire than the first robot. Here it is perfect is the same super attack - meat grinder. So, I have several days yet, I made a few enemies to new locations and a picture for the menu.